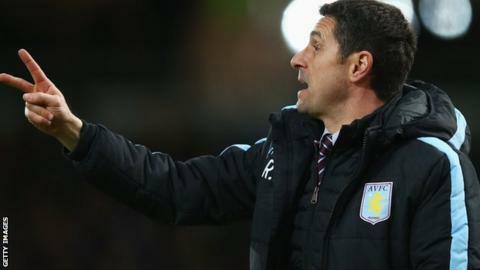 Aston Villa manager Remi Garde says not all of his players are giving everything in the club's bid to avoid relegation from the Premier League. Villa are seven points adrift at the bottom of the table after just three league wins all season. They lost 6-0 to Liverpool 11 days ago, a heaviest home defeat for 81 years. "I don't see the commitment from all the players every day in training sessions," said Garde, whose side play at Stoke on Saturday (15:00 GMT). Former Lyon boss Garde, appointed at the start of November, was unable to make any signings during the January transfer window. The 49-year-old Frenchman added: "If I had the choice of other players I would like to select, I would like to - but I don't have the possibility. "Sometimes it's about fighting and commitment. It's the first thing professional players should have on the pitch. How can you be confident if you're not fighting?" Meanwhile, Garde confirmed he had spoken to Joleon Lescott about the defender posting a picture on social media of an expensive car just an hour after the defeat by Liverpool. Lescott, who was widely criticised by supporters, has apologised and said the message had been sent accidentally from his pocket. Garde said: "He told me the same thing that he said to the press. He told me it was an accident. I have no reason not to believe Joleon. "We were together speaking face to face. I believe what he said. I just said to him that I was not expecting from an experienced player such an accident."